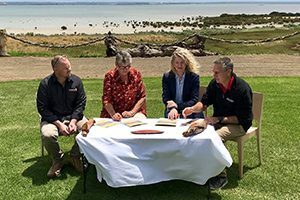 The Port Phillip & Westernport CMA is proud to have recently signed a formal partnership agreement with the Bunurong Land Council. PPWCMA Board and staff joined Bunurong Land Council CEO Dan Turnbull and Chair Aunty Dyan Summers on French Island on Monday 9th December 2018 to sign the agreement. The agreement sets out both organisation’s commitment to working together to develop Bunurong’s goals and aspirations in natural resource management and sustainable agriculture. As part of the agreement, the PPWCMA has committed to continue working with Bunurong to care for Country and support increasing Bunurong’s knowledge of their traditional cultural practices and sites. The PPWCMA now has partnership agreements with all of the region’s Registered Aboriginal Parties (RAPs). You can view all of the agreements and the PPWCMA Indigenous Participation Plan on our Engaging Indigenous Communities page.